Dear Readers, it’s been a while since I featured food here, so in the form of a very unofficial awards ceremony, here’s a hatrick of great value Indian food in London. Run as a student hostel, the Indian YMCA, near Warren Street, hosts people from India and caters for their taste buds. As is typical with authentic food, it’s cheap, with meals costing around £5.50. You pick from a range of dishes in a canteen format. Check the hours for meal-times, but it is open to the public. Opened in 1965 Ambala has gone from strength to strength with various outlets in London, including its flagship store on Drummond Street, Euston. Their sweets are delicious and their pricing reasonable. They make lovely savouries with the pakoras highly recommended. You can also order online. Also based on Drummond Street, Euston, home to a number of good vegetarian Indian restaurants and Ambala, Ravi Shankar cooks up some mean South Indian lentil pancakes, Dosas which will appeal to those creatives of you out there as they look as delicious as they taste. 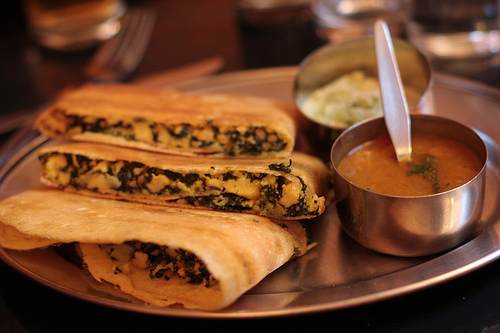 Try the papar or masala dosa or the thalis! Image above of Ravi Shankar spinach and paneer dosa courtesy of www.gutfud.com whose review can be found here. Posted in: things to do online, venues (restaurants, shops, bars).